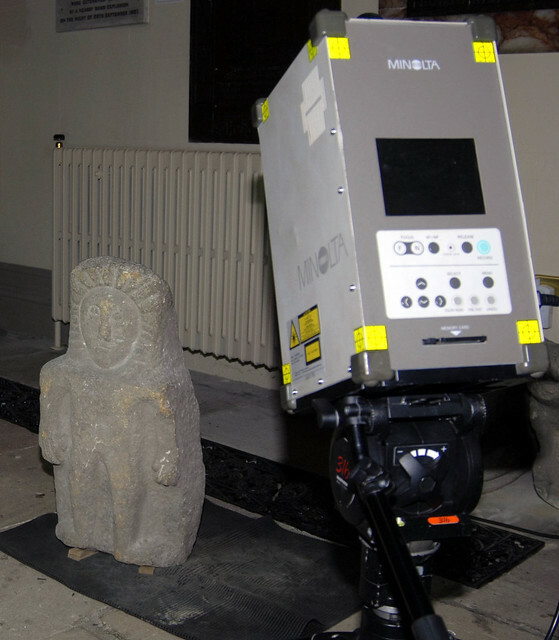 Deri Jones & Associates Ltd and Geospatial Survey Solutions Ltd (DJA/GSS) assembled a diverse team of specialists to enable the National Museums Northern Ireland (NMNI) to create accurate 3D replicas of important carved stones at Armagh Cathedral. With kind permission of the Cathedral, we recorded the three stones from every angle using our Minolta Vi900 high resolution scanner. The scanning work was carried out in situ to minimise disruption to the display, working over a 12 hour period, including a memorable organ recital! 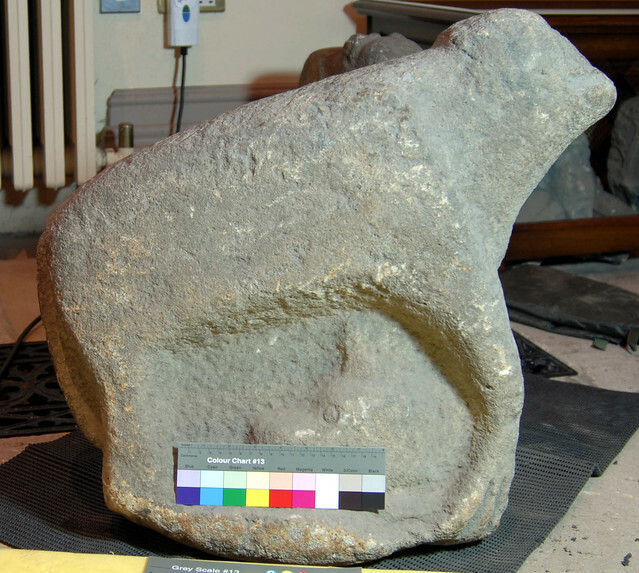 Some 400 scans covered the entire set of stones at sub millimetre measurements and a series of digital SLR camera photo's recorded accurate colour information for the replication. Back in the office, DJA/GSS processed the scan data to register it all together. Starting with lower resolution wide angle scans and working the finer data in on top of this, this 3D jigsaw puzzle took some 4 days to produce accurate coverage of the entire set of stones. Once the point cloud was assembled, each stone was meshed using 3D Reshaper software, creating detailed high resolution mesh models of each of the stones with polygon sides typically less than 1mm. 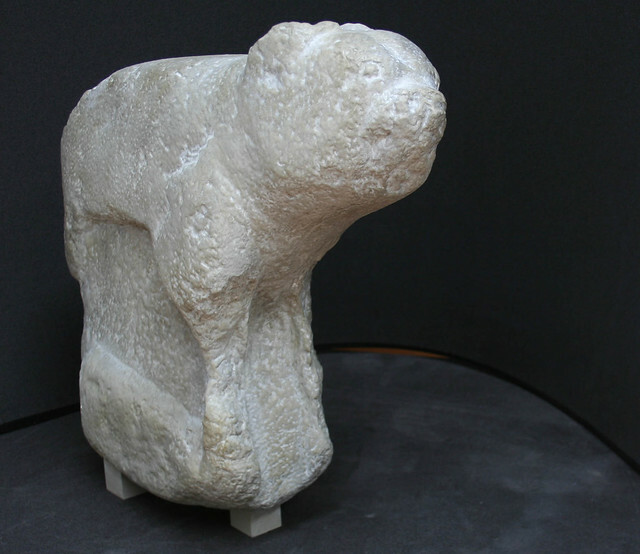 To these meshes, peg feet were added to simplify fitting of the stones to their mounts at the museum – a benefit of digital replication. The finalised polygon files were between 150-250Mb in size as STL deliverables, ready for rapid prototyping. DJA/GSS had approached several companies to provide the large scale replication service required – many companies suggested that the work would have to be done as separate sections and assembled to form the final stone replica. 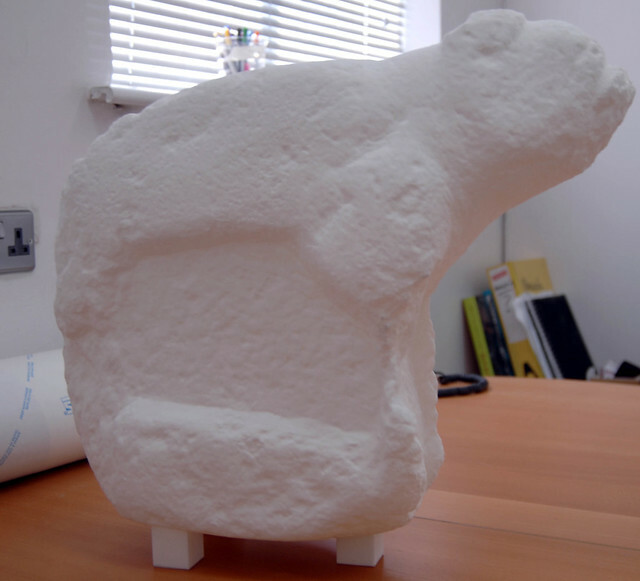 Cardiff University's Manufacturing Excellence Centre (MEC) impressed us with the size of supply and speed at which the replicas could be produced. Two days after sending down the first large STL file, we were invited to call in and pick up the SLS replica – looking resplendent in a plain matt white finish. During the processing of the data, discussion with the client led to the conclusion that rather than replicating the thousands of years of dirt and stains that had discoloured the original stones, the replicas should be finished to a cleaner, light sandstone colour. DJA/GSS had spoken to several companies experienced in model making, but Specialist Models Ltd, based in Cardiff and responsible for many incredible TV and film sets had the skills and speed to supply the replicas in time for the opening of the new gallery. Working with the SLS models direct from the MEC, Specialist's team applied a complex layered set of paints and washes to replicate stonework – the final result looking indistinguishable from carved stone, until it was picked up, weighing some 2Kg! The final coat of paint dried, the replicas were shipped to NMNIin time for the opening of the new 'Early Peoples' gallery. For more images, please see our Flickr gallery.